Please support the channel by liking, subscribing, and hitting that bell today! Really like what I do there are three more ways to do so. Rabid Hedgehog is not a paid endorser by any company he relies on support from viewers and patrons like you. Thank you! Fuel injection with 10.7:1 compression making (Rear Wheel by Dyno) 39.36 HP 7670RPM and 29.86 Lb-Ft. TW at 6190RPM. You are correct. It is the first modern era cruiser because they oddly have left the 6 speed out for a long time. I agree with all the things that you said are wrong for this bike. Because a new rider needs to be adjusting their rear spring...and I found the front suspension great, that's why it works as it does. Well it was adjusted the way it needed to be done. I still have it and just did the year update. May have a guy to do that soon. No problem! For me being taller and longer legged it does not effect me as it would some. But I try to be honest from all angles. Yeah watch the whole thing own it love it. 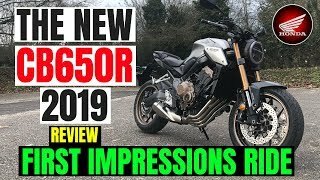 After hearing all the initial bitching I thought this thing would be a turd.After the ride review I thought if you just tweaked the suspension and changed seat it would be one hell of a bike. That's all it needs. I have the place to do the suspension now I just need the funds or well the lack of temptation to get a Moto Guzzi by selling this one as he is a dealer in Guzzi but a custom bike builder all in one. Will this bike handle 1 hour commute on highway going 70mph ? Will it be unstable or uncomfortable? +Rabid Hedgehog thanks a lot. Speed and stability are good. Comfort is dependent on how tall and heavy you might be due to seat and suspension setup being more suited for someone less than 160. 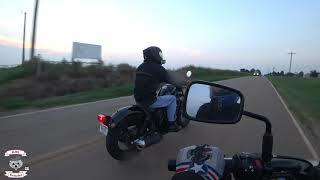 Had honda rebel 250cc long ago but took to uncle home put in barn a storm & tornado it was gone! Sounds like an Oklahoma Spring sadly. Hate to hear a bike has been taken by storms. In the display, is there a gear shift indicator? This one of 4 bikes I have found that my girlfriend can ride easily as she can reach the ground comfortably, not just her tippytoes even though she is 5" and weights 104 pounds. She is going to start taking her licence this year (we live in Norway) and we're looking for a bike for her that ideally doesn't need to be lowered. 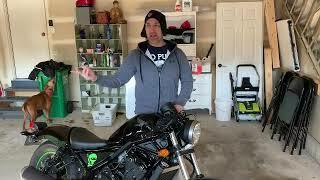 The second one is the Kawasaki Vulcan S, but she finds the riding position uncomfortable (she looks bent like a shrimp, haha). Third one is the Harley Davidson's sportster which is too expensive, and last Triumph Bobber, too heavy and expensive too. Driving schools here don't have them either. 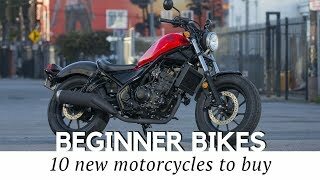 Anyway, do any of you have any other suggestions to other bikes we could try? Thanks for the video man! 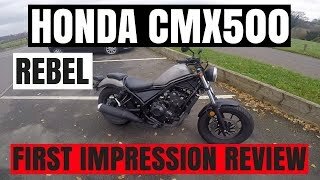 Went and looked at the newer one of these today and its most definitely going to be my first bike, i love that its a smooth ride and i love that its gonna be fast enough that if i choose to take trips on it i can! How many miles would you say you get per tank in normal driving conditions? Interesting, as far as I am aware and looking at Honda's page they appear the same. I have seen from 120-160 depending on conditions. Since it's been super cold I get them warm and it's trending a little lower right now due to the times idling to a decent temp. Light turns on around 110-130 in the experience I've been having so far. Fyi, cruisers are standards. The term "cruisers" came from the Japanese when they were trying to enter the western market (North, South,& Central Americas). Harley and Indian never called their bikes "cruisers" until the late 60s when manufacturers like Honda and Suzuki came along. I do, however, agree with you on that 80s style or Harley's style brake light. It needs to go away. These can be outfitted with passenger seats and in other markets they are already installed. All the old rebel needed was a 450 engine on it. 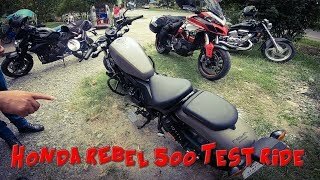 I had an old 450 rebel. God it was fun. Well not too far away in the 467CC range here with that. I do wish the 450 Rebel made it out of the 80s. So stiffen the suspension and replace the rear lights, seems easy enough. +Rabid Hedgehog maaan!! imma straight cop a scrambler kit !! She has passed 2300 miles in about 8 months but she shares the riding duties with a CB1100EX which was bought two months later and lurks behind by only 200 miles and I have also put around 2300 on my wife's Vulcan S since her health as been off this last year. 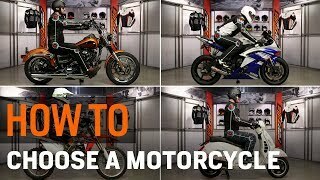 Hi, great video! I’m 5’8 and around 180 pounds is this bike for me? lol 😂 I like the seat height. I was kinda wondering if your under 200 pounds the suspension might be ok? 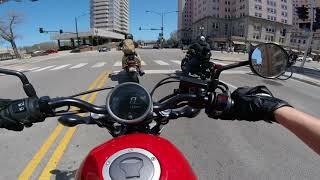 I’m a seasoned rider but getting to old for sport bikes. I’ve been kicking the idea around to buy a dual sport bike. But there so slow on the highway. I’m really looking for a commuter bike. (30 miles) round trip to work and back and something to play around on. I’m Not looking for a long distance bike or anything. Any thoughts? Why do you make comparisons to the Ducati? 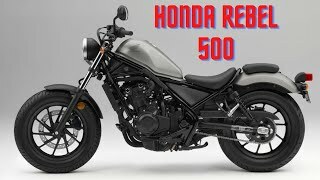 How much does the R500 cost compared to the Duc? Glad to see that in the end, you like the bike. And, I hope you do the mods you talked about. It's a great mid sized bike. 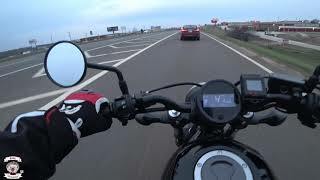 Ducati Scrambler Sixty2 twin 400CC is the targeted bike. It's basically saying for Ducati it skimps on price but not on presentation. 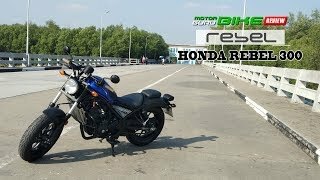 Could not compare it to the HD Street since it skimps on both like most bargain motorcycles for brands. 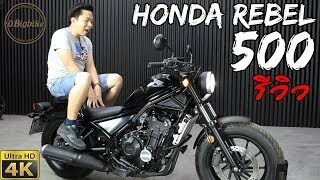 Put it this way had the Monkey been out or announced at the time of this video it would have literally been compared to that since it's gauge cluster is superior despite it's micro bike and price category. Because these things can be worked out and it's a good platform to build on. whats the ducati counterpart for this model? 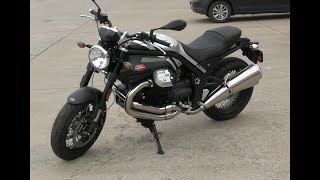 Scrambler Sixty2, the 400CC model. They have climbed to near 8K now but they are close enough in price. I had been wishing for a Rebel with a larger engine for a good ten years (ever since I learned to ride). I learned on a 2004 Rebel, but longed for more power. 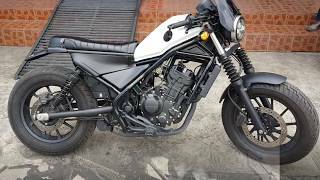 I tried a Honda CB919, which I loved to ride, but was too tall to feel entirely safe in sudden stops or maneuvers. 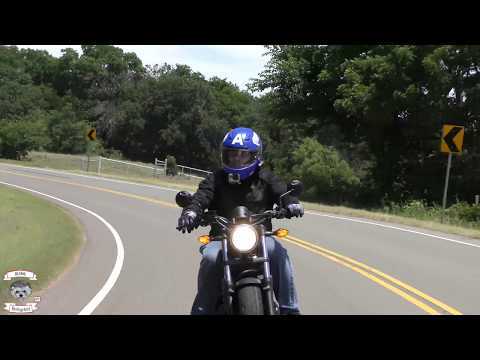 Next was a Harley Sportster 880 Superlow, but that felt heavy and sluggish. 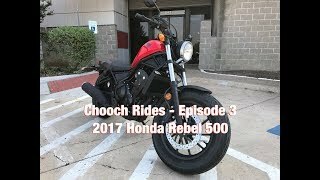 So I was thrilled to hear about the Rebel 500, and bought one last year. The things you cite as 'negatives' about it don't bother me a bit. What I HATE is that the handlebars pull me so far forward. It's SO different a riding position from the old Rebel. 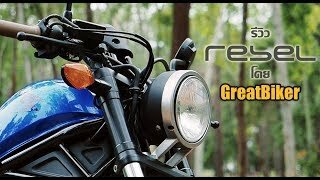 And finding a replacement handlebar that simulates the feeling of the original Rebel is super-difficult, not to mention expensive. 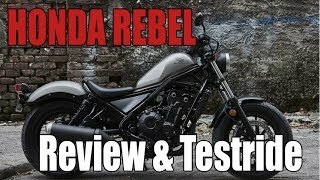 It's deceitful that they called the new bike a Rebel. It is more CB than CMX for sure. I have had this bike getting close to a year now and it is not bothering me as much as it once did. I'm a woman 4'11 and 116 lbs. 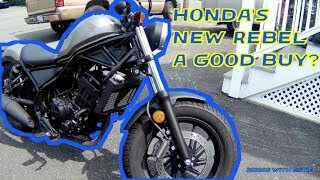 bought my first bike Dec.2018 a 2015 Honda Rebel 250 and I love it . I think it's more than enough bike for me being I only want to ride it out on the country roads for now. Maybe one day I'll move up to bigger like the 500 but my little 250 suits me just fine for now. I really enjoy watching the videos and learning lots ...wish I had watched some videos before i struck out practicing in my yard on wet pine straw and now i'm suffering from a broken ankle. LOL can't wait to get back on and try again. I hope you get well quickly so you can! Why are your knees hugging the tank?......give your balls some air dude!!! Hi Rabid, thanks for the video. 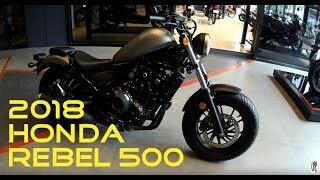 I will be buying a Rebel 500 in the near future, and I have a very serious question for you; I am planning to change the seat, and put a spring seat. (a spring seat is my dream, I buy the rebel specifically to put the spring seat as a harley will be too expensive to me). What is your opinion on the spring seat? do you thing it will make the ride more comfortable? 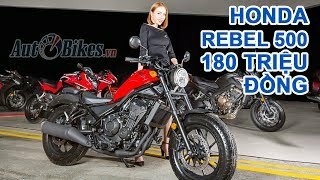 Honda's New Rebel - Should you Buy?